Aykroyd (right) poses with fellow actors during shooting. 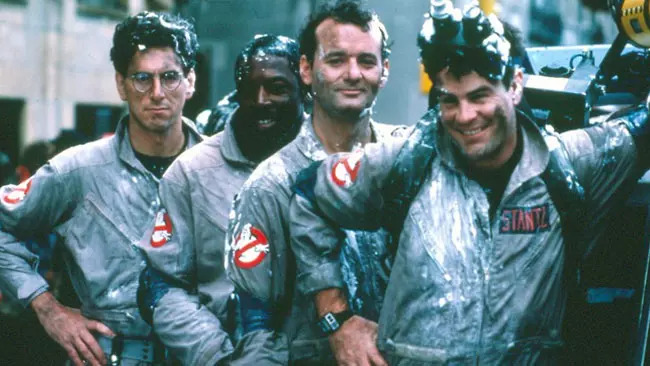 “Who you gonna call?” a phrase often quoted in reference to the film Ghostbusters, has maintained popularity since the film’s release in 1984. The science-fiction comedy has entertained millions with the idea of spirits and the need for their extermination by a team of scientists, composed of all-star actors Bill Murray, Dan Aykroyd, Ernie Hudson, and Harold Ramis. One of the film’s writers and actors, Dan Aykroyd, is credited with much of the humor and wit in the dialogue. In turn, he credits his success to something that makes him different from the rest of the cast: his diagnosis of Asperger’s syndrome. Asperger’s Syndrome is a subcategory of Autism Spectrum Disorder, with its own specific set of traits for diagnosis. The most common indicators for Asperger’s tend to be difficulty with social interaction, maintaining eye contact, understanding social context and underlying meaning in conversation, and often having an intense interest in specific subjects or topics. It is noted that in Asperger’s there is not typically a language delay as there is in autism, however those diagnosed with Asperger’s tend to have atypical speech pattern or other differences in their language (Autism Society). Many of these characteristics can be found in the behavior of Aykroyd, as he came to discover when he was diagnosed. Aykroyd combined his Aspergian fascination with law enforcement and spirits to create the concept for his extremely successful film. Aykroyd received his first diagnosis, a diagnosis of Tourette’s syndrome, at age 12. It was not until later in his adulthood that he was diagnosed with comorbid Asperger’s syndrome (Daily Mail). In many interviews, Aykroyd has described his difficulties with Tourette’s, “I had physical tics,” he says, “nervousness and made grunting noises and it affected how outgoing I was.” Although he has faced adversities due to his disabilities, in the grand scheme of things, Aykroyd believes his creativity and imagination spawned from his ability to hyperfocus- a common trait in individuals with Asperger’s. The idea for Ghostbusters is related back to another aspergian trait that Aykroyd possesses, “One of my symptoms included my obsession with ghosts and law enforcement — I carry around a police badge with me, for example. I became obsessed by Hans Holzer, the greatest ghost hunter ever. That’s when the idea of my film Ghostbusters was born” (Daily Mail). While Aykroyd has been diagnosed with a very mild form of Asperger’s syndrome, he has still experienced the difficulties associated with it, however in turn he has found a great deal of success from the gifts it has given him. The social difficulty he faced as a child with both Asperger’s and Tourette’s syndromes is balanced by his imagination and creativity that he harnessed through his ability to maintain focus on particular subjects of interest. These typical characteristics of Asperger’s Syndrome provided Aykroyd with the tools for his success, and given the proper environment can provide the tools for success for others with the diagnosis. Dan Aykroyd is an important example of an adult with Asperger’s Syndrome, as his creativity and ability to imagine defy the negative preconceptions that are typically associated with the disorder.